If you want to create a good iteration and release plan, you should make sure that you work on the high value stories. But how do you know which stories have high value? It’s simple: your Onsite Customer will tell you. You do have an Onsite Customer, don’t you? But how does the Onsite Customer decide? How does your company prioritize stories, epics and projects? In the XP Game you get story cards with the Business Value number already filled in. That makes it easy to prioritize: just look at Business Value/Cost. The Business Value Game looks at the problem from the Onsite Customer’s point of view. Vera and I developed this game as a complement to the XP Game, to explain the difficulties facing the Onsite Customer. We simulate a situation where a group of salespeople sell projects to customers (like Jonathan on the right) and need to decide what the development team will implement. The goal of the game is to make money by releasing features and by keeping customers happy (by releasing features). Over 6 iterations, we introduce Customer Requests like the one below. Each request generates some income for the company when all the stories in the request have been implemented and released. Delivering a release makes the Customer happy. 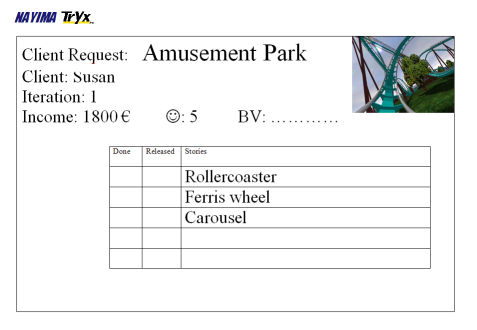 The players need to define the Business Value of each Request taking into account many factors: potential income, potential customer happiness, constraints, deadlines… Using the estimated Business Value and the estimated Cost (already on the Story cards), the team must decide which stories go into each iteration. Of course, the developers can implement no more than their velocity. We introduce more and more difficulties and parameters in each iteration: developer output fluctuates, there are dependencies between projects, some Requests are inconsistent, you can invest in process improvement and many more that we can’t reveal now. Tryouts are an essential part of game development. I hosted a tryout at Agile 2008. Last Wednesday Vera and I hosted a tryout at the Belgian XP Users/Agile Belgium group meeting in the offices of Cap Gemini. We received a lot of feedback from the participants at both tryouts. Thank you. We have so many tips and ideas that we’re thinking of creating two versions of the game: a basic version with 6 iterations in 90 minutes and an extended version with 9 iterations in 120 minutes. As we add more difficulties in each iteration, the 9 iteration game might become very challenging! The Business Value Game is licensed as Creative Commons and available online like the XP Game, the Bottleneck Game, the Real Options Space Game and Mirror Mirror on the Wall.